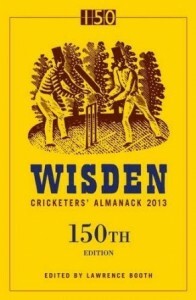 There may have been other occurrences of note dominating the news recently, but against the backdrop of political pundits arguing over the legacy of a dead prime minister and North Korea ramping up the rhetoric, it feels like the release of the 150th edition of the Wisden Almanack couldn’t have come at a better time. You could argue it’s no longer as relevant as it once was, and its pulpit no longer so lofty; the Internet age and the shifting of the sport’s seat of power to the subcontinent means instead of the last word, it’s just another set of opinions. But if history is, as Thomas Pynchon wrote, “a great disorderly tangle of lines”, for many Wisden represents a straight line through that tangle: the comfort blanket the cricket-lover can turn to when the hair shirt of current events gets a little too scratchy. While its unbroken 150-year run represents as much social history as sporting chronicle, that line of yellow-backed spines is as reassuring as a life-belt station at a storm-lashed beach. Even this year’s cover is reassuring, with the iconic Ravilious woodcut taking the place of the now customary photo (the photo will return next year). Wisden didn’t mean all that much to me when I was younger. To a working class kid growing up on a Scottish council estate in the 80s, there were other things in life more important than cricket. Now, I can’t imagine my life without it. In his superb article for the Financial Times, Matthew Engel wrote that Wisden appeals to book-lovers first, cricket lovers second. This mirrors my own experience: even in times of great hardship, the one thing my parents never stinted on was books. The printed word was an escape as well as an education; a love that blossomed into a storage problem with a library now nearing critical mass (I gave up on shelves as a storage option years ago, and dare not even contemplate moving some piles lest they be load-bearing ones). Since discovering my love for the game, I’ve made up for a cricket-less youth by reading everything I can get my hands on concerning the sport’s history. Of the so-far three-hundred-odd volumes on cricket heaped on random flat surfaces around my flat, Wisden comprises a yet-small but still-expanding segment, flashes of yellow strewn like a field of buttercups, keeping the winter’s gloom at bay. I feel extremely honoured to have contributed to this 150th edition, with an article on blogs entitled “On the outside looking in”. And it pleases me immensely that long-form writing is back in fashion, with both the Almanack and its younger stable-mate, The Nightwatchman flying the flag for cricket writing of the highest quality. Not that this is solely the domain of paper and ink: in the age of instant news and 140-character opinions, it gave me great pleasure to highlight in my article blogs which tend towards a more in-depth consideration of their subject with writing that’s informed, intelligent and interesting. They include Reverse Sweeper, Freddie Wilde, and Donning the whites with grace and you should definitely check them out. There will be those who will buy this year’s Almanack as an investment, or to turn straight to the bits that make headlines (the Notes by the Editor, the Five Cricketers of the Year, and the Leading Cricketer in the World) before setting it aside. There will also be those for whom the arrival of a new Wisden means a double celebration, for those who love cricket and who love books, and for whom spring’s been too long in coming. One of my most treasured possessions is another great time-machine of a book, a 1905 first edition of Beldam and Fry’s Great Batsmen: Their Methods at a Glance, with its wonderful, silver-gel photographs of Victor Trumper, Ranji, and “W.G”. It’s a book I dip into frequently, and it reminds me of the ways in which the sport has changed from then to now, and how many things have stayed just the same. Now to find room for the 150th Wisden beside it. It’s been a roller-coaster, the last few weeks. It culminated in the doorbell going on Tuesday and my partner solemnly placing an Amazon package in my hands, and my fingers fumbling clumsily with scissors, sellotape and cardboard as I opened it. The packaging you want to open quickest always gives the most resistance. 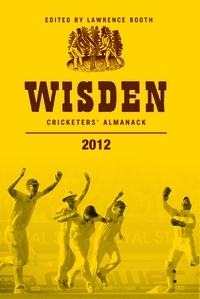 In February last year, I was fortunate enough to be asked to write the article on blogs for this year’s Wisden Almanack. It’s sitting beside me as I type this – custard-yellow cover adorned with celebrating England fielders in fitting recognition of Team England’s ascendancy to number one Test nation. It has the reassuring heft of scholarship, tradition, and high quality writing, and for the first time has the name of Lawrence Booth on the cover. After skimming briefly over my article to reassure myself it was really in there, and the last year of reading, note-taking, collation, near nervous-breakdowns, writing, rewriting and polishing hadn’t all been some fever-induced dream, I put the Almanack back down and spent the morning eyeing it nervously, circling it from a distance. These things can take some time to sink in. Then, predictably, the cricket fan in me gained the upper hand, and I started greedily perusing the other articles like a starving man at a gourmet dinner: the Five Cricketers of the Year (Tanya Aldred’s “cheese sandwich” line in her piece on Tim Bresnan has rightly been quoted numerous times), Gideon Haigh’s trenchant take on the ICC, Mike Yardy’s moving account of the depression which forced him home from the 2011 World Cup, and most notably Lawrence Booth’s hard-hitting view on the responsibility cricket boards must bear towards the well-being of the game… these are just a few of the many pieces of superb writing that you’d expect from the longest running and most famous sports annual in the world. My article, “More rewarding than the facts”, is on page 161, if you fancy reading it. There are a lot of blogs out there. Theodore Sturgeon once said that ninety percent of everything is crap, and this applies as much to blogs as anything else. But there is some superbly informed and passionate writing out there. I didn’t just want to do a list of the best, most of which the average internet-savvy cricket obsessive will already be familiar with. I wanted to highlight the ones that afforded an alternative window on what was happening in the cricket world at the time – writing that would make you think, raise an eyebrow, shake your head, or possibly even all three. I also wanted to show that blogs and blogging, if not yet quite accepted as legitimate journalism, are at least attracting the attention of those in the sport’s upper echelons – something I experienced myself when Mike Atherton was kind enough to comment on my article on his interview with Mohammad Amir. At the end of the day, I am just a fan. I’m an intensely private individual and I value my anonymity; like most introverts, I don’t crave the limelight and have little interest in self promotion. I am happier on my own or amongst a few like-minded cricket obsessives at Grace Road on a rainy April afternoon than I am at black tie dinners. But when Wisden calls, you answer. My main fear was that I’d miss some hidden gem, some piece of inspired lunacy or creative brilliance, but once I’d gathered my material, the gist of what I wanted to say took shape and my train of thought suddenly acquired a destination; the writing became the easy part. This was aided in no small part by the encouraging approval Lawrence Booth gave to my proposal, his helpful suggestions, and his assured touch as an editor. For the foreseeable future, the Almanack is in extremely good hands. The best thing, though, about being published in the Almanack is seeing my name included in a list of contributors who, between them, have written at least a dozen of the books that currently occupy pride of place on my bookshelves. I finally saw sense in deciding not to pluck them all off the shelf and take them with me to the Wisden dinner to get them signed. To be listed alongside them and to be sitting amongst them on Wednesday night in the Long Room at Lord’s was an incredible honour and a dream come true. Thanks must also go to Jarrod Kimber, whose article on the top Tweets of the year filled out the third page of my article. It was Jarrod who passed my details on to Lawrence and gave me this opportunity. Finally, I’d be remiss if I didn’t mention the support and patience of my long-suffering partner, who once wryly observed that I can talk about cricket for four hours and not once repeat myself – and didn’t mean it as an insult (I think). Cricket is a broad church which provides a welcoming sanctuary to a wide range of eccentrics and obsessives. I understand there was one such in situ at The Oval recently who mistook a pigeon for Jesus. Me? 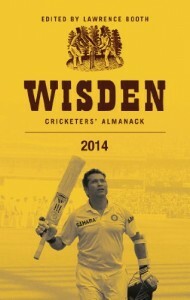 Well, they let me write an article for the Wisden Almanack.